PURRfecto Pooch Pawty - Doggone Great! Youza never ever gonna guess what me and my paws didza this weekend so I guess I'ma gonna have to tell ya what I didza this weekend! Are youza pawsatively ready to hear this? I went to a Pooch Pawty, yep uh huh, me and myself wazza content-a-cat guests at my furiend BONZER's pawty. Datsa Bonzer and me in da picshure. Now thizza is no normal pawty - itza ImPURRted pawty cuz my pal Bonzer lives in ALASKA! YEP, uh huh he flew on da giant bird with super sonicat wings to get here and host da pawty. Cuz I'm not even 4 yet, me and myself dontza have da CalEyeFurKneeYah drivers license so my doggone great furiends Josephine & Jolanda picked me up and weeza drove in their DogO'limo cross da glistening Golden Gate Bridge to get to da Pooch Pawty. See howza ecstaticat Jolanda izza cuz sheeza smiling doggone purrrrfectly - wellza itza cuz I'm tickling her ear with my meowster whiskers! Da pawty guests wazza very diverse (and thatza politicatically correct). Check out these minichure goats whooza discussing which one should introduce themself furst. They didn't knowz I was listening. Meet my pooch pal MerryBelle - sheeza very merry cuz sheeza flew on da giganticat jet bird all da way cross da YouEssHay from New Yawk - looks like sheeza merrily merry to see me in fine funtasticat New Yawk style, yep sheeza doggone happy to be in here in CalEyeFurKneeYah! More WOWza MEOWza - I'ma so so so happy to be at da Pooch Pawty with my furiend MIA - sheeza from da South of CalEyeFurKneeYah and sheeza one smart Pooch with da strong senses cuz sheeza blind but Mia knows exacticatically where me and myself izza and datza all thatza impurrtant. Ohhh Momma Meowster MIA! You makes my meowster heart go bumpity bump bump, just like whenza I'm riding da rails of da San Franfuncisco Cable Cars dat humm da "Mice A Roni Da San Francisco Treat" tune. Me and myself wazza stretching out in da abundacat sunrays at da Pooch Pawty about to catnap whenza someone said "Moose Burgers from Alaska Hazza Arrived". WOWza MEOWza, datza Giganticat mound O' meat and I'ma ready fur my furst Meowster Mooster Burger! Thizza izza da purrfecto pawty. Meowster Mooster Burgers and Salmon frumza Alaska. Bonzer brings da 27 paws long Salmon, yep, I means furesh from da waters of Alaska - yep uh uh, weeza chowing down on da Barbequed salmon thatza WHITE not red (dat means there's no Dye Numero 3,4, 27 or 6) and itza better than da salmon in da Fancy Feast can. IF me and myself couldza eat this every day, I'd purrobably have more than 9 lives! AhTenZeeOhKnee - Itza time fur fun and games and itza fur shure, da Dogs like tooza dip da paws in da water so I dived in da pool with my pooch pal Tillie - sheeza keeping 2 doggone great eyes on me even though I'm wearing my "feline float" Guido Speedo but I furgot to bring my Life PURRsevor to da pooch pawty - hey, I knows Tillie izza my Life PURRsevor in case I can't do da back stroke no more. My Cat-stylist and da Staff, all had da day off so I had to fluff dry my fur in da sun then I helped out with da fun stuff. YEOWza MEOWza, I went into Shocksatini cuz theyza shudda had me in da booth dat was 100 PURRcent ITALIANO Dark Roast NOT wtih da inFURior Colombian stuff! HEY I'ma the EyeTailYun Kitty! Basta Pasta itza not impurrtant cuz I still gave all 4 of my meowster paws to help with da T-Shirt Drawing and, and AND guessa whatza? I wins da Catster T-Shirt at da Pooch Pawty! WOWza MEOWza, life is full of SirPrizes! So mio myo furiends, itza inevicatable youza gonna meet and greet purrrsons dat youza normally wouldn't meet and greet and itza meowvalous to put a furiendly paw furward. Itza just doggone meowvaloso to meet da diverse purrsons of all sorts and sizes. Some got 2 eyes, some gotza no eyes, some gotza fur galore and some gotza almost no fur (oh no tip fur dat groomer!). I'ma furtunate fur shure, to have so many fabucatulous furiends all around da globe and being invited to da Pooch Pawty in Petaluma wazza so so so speshule fur me and myself. So, my smitten kitten self suggests YOU go to a doggone POOCH pawty sometime fur a doggone pawsatively great time. Wishing youza da nonCATastrophic week! Envirocatically Speaking - Every Day Izza Earth Day! While me and myself izza doing the bench purresses (I gotta keep my smitten kitten meowscles condishuned!) I purrponders how to be a better envirocat and a respectacatable resident of the Earth. Weeza all tenants of The Earth and when youza renting space youza wanna take care of it so I tells ya, Earth Day 2010 izza arriving, yep uh huh itza coming to YOUR street on Thursday April 22nd, and here's some fine feline tips on having a speshule Earth Day. If youza like me, youza got abundacat papers, some papers not so organized so you can play in them. Youza got papers in all shapes and sizes to catnap upon too. So when youza Spring cleaning (itza OK to Spring Clean thru Summer, Fall and Winter too) you always wanna put all da papers in da correctacat Recycle box NOT in da compost box and definicatically NOT in da litter box! Take a meowment to sepurrrrrrate yur trash- yep uh huh, youza gotta go thru it with a keen Cat's eye to be shure youza putting the correctacat stuff in da correctacat receptacle. And hiss fits if youza thinks plastic bags izza recycled! If youza has a passhun, like me, fur da Seafood, make shure youza purrrrrchases da firm rising fishes, oopsatini I mean to say Farm Raised Fishies, then youza not depleting da fabulous fishies in da Oshuns - cuz their fishy selves izza doing their part to keep da Oshuns clean too - weeza needs da natural fishies but not on our dinner plates. So puhleezse, may I have yur AhhhTenZeeOhKnee? When Thursday da 22nd day of April arrives in your City, join ME and Myself and more than one billion people in 190 countries thatza taking da action for Earth Day this year. Youza can be a very impurrrtant part of helping our Mother Earth, cuz sheeza in a CATastrophic condishun right now! 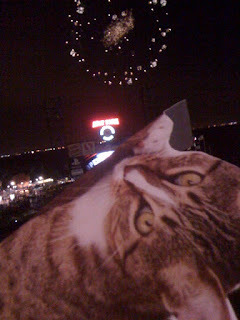 My smitten kitten paws izza up Up UP in da air while out out out at da Ballpark cuz I'ma purrracticing catching the ball at the baseball game opener without wearing da Smitten Kitten Mitt. It's what you do at da ball game - youza has a ball trying to catch da ball. Always wear da team's hat so youza looks like a fantasticat fan! It's fur shure youza gonna see all da players from da View sekshun - itza da Birdie Eyes View! da Ballgame cuz theyza happy folks and really happy to see ya! Shuksatini! Even if yur Team duzn't win, da sparklies start flying from da sky and fans izza saying "oh my oh my"! Defnicatically YOUza winner cuz youza got off yur sofa and out of da house to help yur Team - showing supuuuurrt is speshule. AhTenZeeOhKnee! Youza wanna see all da fireworks frumza every direkshun, so get down on da ground and check itza out from all da pawzishuns in yur PurrEyeVat box seat. Ah, basta pasta! I luvs da sparklies in da Sky and now youza knows why. 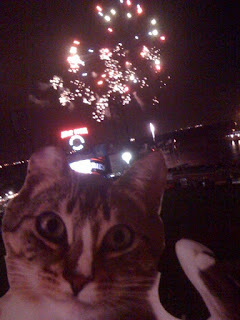 NOWza MEOWza - youza gonna have a sparkly kind of winning week with no strike outs. Make it a nonCATastrophic one! Me and myself izza what we is because of momma Baci raising me all my life - she had da payshunce with my wild child self. Yep uh huh, sheeza been my momma da whole almost 4 years of my life, and sheeza taught me my meowster manners while tolerating my smitten kitten antics. 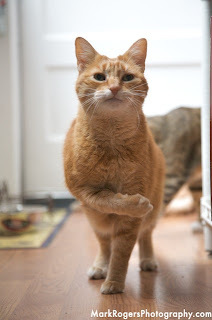 Baci crossed over The Rainbow Bridge on Saturday April 3rd and I wanna paws fur a meowment frumza my normal Catzowey day, to pay da tribute to da redhead who made me whooza I am. Born on da streets of San Franfuncisco (after Karl Malden & Michael Douglas left da Streets of San Francisco) in October 1995, Baci found her furever home cuz of da San Franfuncisco SPCA rescuing her and well, da rest is historicatically meowvalous history. Ahhh she loved me from da meowment I arrived in her house. She was happy to see me, but everybody calls Baci "Mrs Grumpy" cuz datsa da look sheeza got all her almost 15 years of life. My molto famoso photographer Mark Rogers even made da "Birthday Card" using Baci's not smiling face, and if youza furtunate to receive his speshule card, youza opens it up and it shouts "NO! Really I AM happy it's your Birthday"! Baci gotza her very own line of speshule OK-shun cards on da market. Datsa something! Always, Baci wazza da boss of da house, ruling with da 4 redhead paws and we izza shure she selectacatted da Easter Eve to cross The Rainbow Bridge - exacticatically her way cuz that's how life was with Baci. I'ma calling it "Baci's RED-surrection". 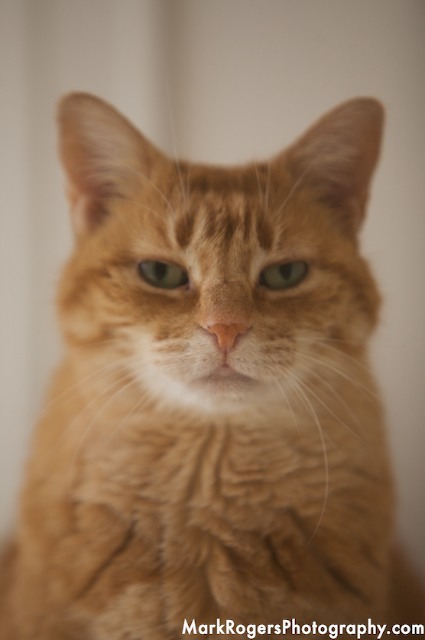 See, sheeza still looking da grumpy look! But fur all her life sheeza consistent creature of da habit, da purrfecto kitty. Losing my momma Baci izza da impurrtant reminder dat life is short - even when ya got 9 lives, so be shure youza enjoys it to the meowximum and tells someone speshule dat theyza speshule or they won't ever know theyza speshule. Cheers tooza you Baci and mille meowster grazie fur being my speshule Momma Cat.